The Troia Golf Championship Course is located on the Troia Peninsula – about 40 min. drive from Lisbon. 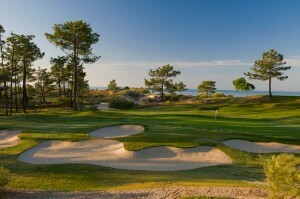 The Troia golf course lies on a long flat and sandy stretch of land across the Sado Estuary, which separates the Setubal lagoon from the Atlantic Ocean. In this scenic location, golfers will enjoy one of the most fascinating and challenging golf course in Portugal. Troia golf course is a major challenge to any golfer. 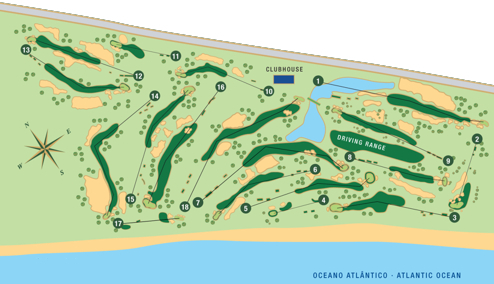 Troia Golf is one of the links golf course (on the sea side) designed by the famous Robert Trent Jones Sr. The prestigious architect’s signature can be seen on the greens, which are small, narrow and always well protected, sometimes by huge bunkers. From the back tee the Troia golf course opens with drive over a sizeable lake and the green is so closely bunkered that even big-hitters will have difficulty in getting home in two. Then comes, hole Nr. 2, a stunning par tree with the green nestling on the edge of the beach, some 200 m. distant. The 3rd hole of Troia golf is such a beauty that it will enter immediately among the 18 holes of Trent Jones’ dream eclectic course. The 4th, played along the edge of the shore is another par tree, much shorter than the second; it is very tightly protected with a cavernous bunker waiting for the tee shot which drifts away on the sea breeze. There is only one slight respite the short but tricky par 4, hole number 8, before the turn.